This report analyses the link between the industrial allocation of FDI and economic development, using a newly constructed data set on industrial FDI stocks for six individual manufacturing industries (food, textiles/wood, petroleum/chemicals/rubber/plastics, metals/mechanical products, electrical machinery, transport equipment). We give a comprehensive overview of the economic structure in a range of countries, including OECD members, the new EU member states and East Asian countries. The time period analysed ranges from 1987 to 2000, with differing coverage for the individual countries. The particular economic development patterns of these countries are described through economic indicators such as industrial output, employment, FDI, exports, imports, wages, productivity, unit labour cost, etc. 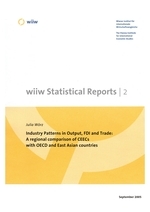 We further analyse global specialization patterns in terms of production, trade and FDI. We find substantial differences in specialization and catching up patterns between geographically defined regions. While the transport industry plays a crucial role in the lagging OECD countries, electrical machinery is one of the key industries in East Asia. The relationship between FDI, trade and output patterns varies both across countries as well as across industries. In general, the relationship is stronger in catching-up economies, with a significant role for FDI in the development of certain industries in CEECs (transport equipment) and the four Asian Tigers (electrical machinery).